Our basement finishing experts in Georgia have been trained to offer only the best basement designs. They utilize 25 patented products from the Total Basement Finishing (TBF) product line and will meet with you to review and discuss your plans for your basement. The TBF system transforms any basement from the stereotypical non-aesthetically pleasing attributes of a basement into a beautiful and comfortable space. Not only will you enjoy this space, but it also adds value to your home! No longer experience the effects of mold and mildew damage, because the TBF system meets the basement’s need for inorganic materials that don’t foster mold growth. In addition, we provide a 50-year mold-and-moisture warranty. If you want to completely remodel your Georgia home’s basement or you’d like to simply refinish it, we’re the company for you! Our trained Georgia basement contractors have years of experience in remodeling, refinishing, and renovating basements. A basement doesn’t have to be a cold, uncomfortable space that floods each time it rains. With the help of our Georgia basement contractors, you can enjoy a brand new game room, man cave, lounge, bedroom, or maybe just an organized and dry storage space. 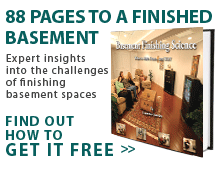 Contact your local TBF dealer for a free estimate for basement finishing in GA.